MEF recognizes the IT professionals who undertake the challenging path of earning skills certification in the MEF Professional Certification Framework. For those who persevere and earn three certifications in the MEF Framework, we award the designation of MEF NETWORK EXPERT. We look forwarding to honoring these individuals in significant ways in the near future. What are the Requirements of MEF Network Expert? 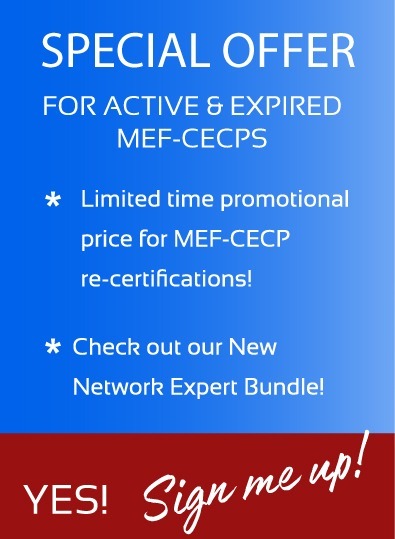 The requirements are simple - you must take and pass all three MEF Professional Certification exams: MEF Network Foundations (MEF-NF), MEF Carrier Ethernet Certified Professional (MEF-CECP), and MEF SDN/NFV Certified Professional (MEF-SDN/NFV), and maintain an "Active" certification status of each and you will be designated a Network Expert and listed on the Network Expert Registry and the Professional Certification Registry. What is the Cost of the MEF Network Expert? MEF recognizes your efforts in hard study, on-the-job training and experience, taking and passing exams, keeping your skills sharp and up-to-date, starting at the beginning and working your way up in technology achievement, so there is no cost to be designated a MEF Network Expert. What are the entitlements and rewards associated with the MEF Network Expert designation? A beautiful certificate, suitable for framing proudly in your office or posting online, honoring your achievement. A special numeric designation for your certificate, lowest to highest. Special recognition in MEF’s Certified Professionals Registry. Listing in the Network Expert Registry. An opportunity to serve in leadership roles in community activities. The MEF Professional Certification Framework indicates there are separate levels of the MEF Network Expert designation. Tell me more!